To add an email account to Shaw, is it just email and hotmail password? Test settings = error connection timed out. Are you looking to get a Shaw email account or are you looking to use an existing Shaw email account as a fowarding to your hotmail/gmail account? Let us know. My dad is using a really old desktop outlook. It’s only for his Shaw email and Hotmail. With a new computer, I don’t plan on getting desktop outlook, so I’d like him to use the web emails. Though the accounts can be used separately, I want to try to consolidate them a bit. I’m currently having a messy experience trying to transfer the desktop outlook contacts to online. E.g. In shaw webmail, I’m seeing a whole bunch of <no name>. (There are various sources of data in Outlook to choose from). Hopefully, just adding accounts would be easier. In Outlook live, I inputted the Shaw account, and I’m currently getting an “update in progress”. For Shaw webmail, I put that Hotmail account that you see in the picture. 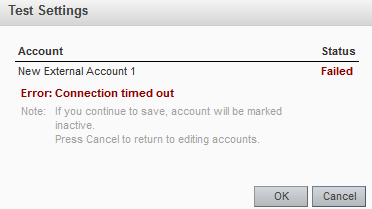 Note: If you continue to save, account will be marked inactive. (I personally only use Gmail, so I don’t have experience with multiple email accounts. I don’t know if deletion in one online email account propagates to another connected online email account. Maybe connecting accounts is just for viewing purposes). Hey! I've never actually done this myself, but I did a bit of digging and it looks like you need to use pop3.live.com as the server and then port 995. Hopefully that works! 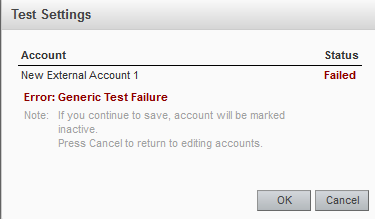 The error changed to “Error: Generic Test Failure”. I think you have to allow POP or IMAP in Outlook live. I still get Error: Generic Test Failure. I’ll leave the post for a future someone to figure out. To be honest, I am not too familiar with this and also a little unsure. 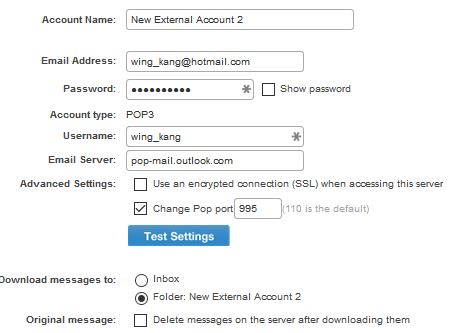 I had a look at this POP3 and IMAP settings for Hotmail and Windows Live Mail | Firetrust and it looks like some settings in Hotmail need to be adjusted as well. Nah, no luck on checking SSL. After some more reading, I think I’ll just move my dad to the Gmail interface, and use POP to send the other email account messages to Gmail. (Gmail says “Add a POP3 mail account you own”. Connecting other email accounts seems to be only working well in Gmail. After connecting, it says “update in progress”, but it seems to be stuck on that. When you click on edit, the default ports are 110 and 587. (There is only one encryption field in Outlook live, so I guessed SSL). It still gives you an “update in progress”. Gmail on the other hand seems to work fine. I think that I only had to put the Shaw email and password. POP.shaw.ca and 995 is put in for you. Also, if you decide to enable the option of being labelled as Shaw when you send a message, the following information is filled. >Last checked: 19 minutes ago.200 mails fetched.View history 161 mails remaining. >Leave a copy of retrieved message on the server. to get rid of duplicate emails. 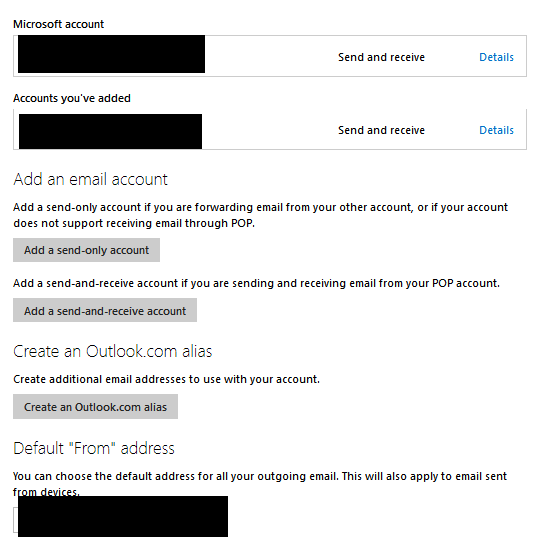 I’m confused as to why I have a different “connecting additional email accounts” page than that person in the first example (sending Shaw mails to Outlook live). On the top left for me, it says outlook.com. For him, it says outlook mail (preview). Nice, so from my understanding all is working well now? Nice catch on the solution too. Think you need to put a check mark next to "use encrypted connection SSL" for your Hotmail account.